My Bohemian Earrings that Jane chose to feature in her book and here is my introduction. “I’m a California girl. I met my husband at age twenty-two in San Francisco and his family became mine. His father is from Nice, France and mother from Vienna, Austria–they speak French, German, Spanish and English all intermingled. I think we have our own language sometimes. We have family in Nice and Antibes, France, whom we visit often and I feel as if I’m European. Our store continues the European tradition of jewelers; all our jewelry is high-end either made by us or other designers. We mix our gold and hand-fabricate. 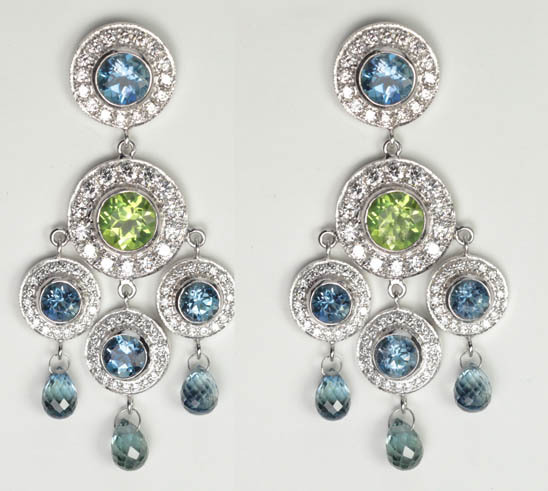 Designing one-off earrings are my specialty! I created one-off clothes from age twelve and just morphed into jewelry. I was a science major in college, molecular biology. Most of my inspirations are from what young hip girls are wearing on the streets–that’s what makes fashion. We travel the world. A pair of earrings, I call “Bohemian Earrings” are inspired from the streets of Paris in July 2011, because that summer Parisian women were going back to the 1960’s wearing peasant blouses, long skirts and dangling jewelry–very natural. I loved the change. My 44.36 cts. 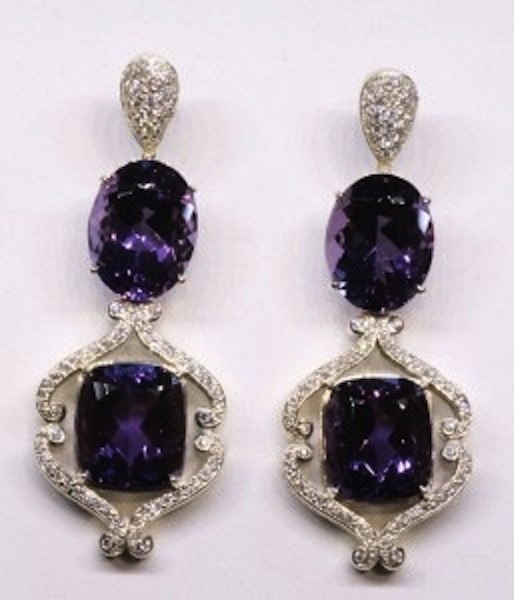 Amethyst and Diamond earrings, also featured in the book, were sent to Hollywood for the Emmy Award Presentation in 2013.